Move earth with the excavator, use it to load the tipping trailer and transport away directly. 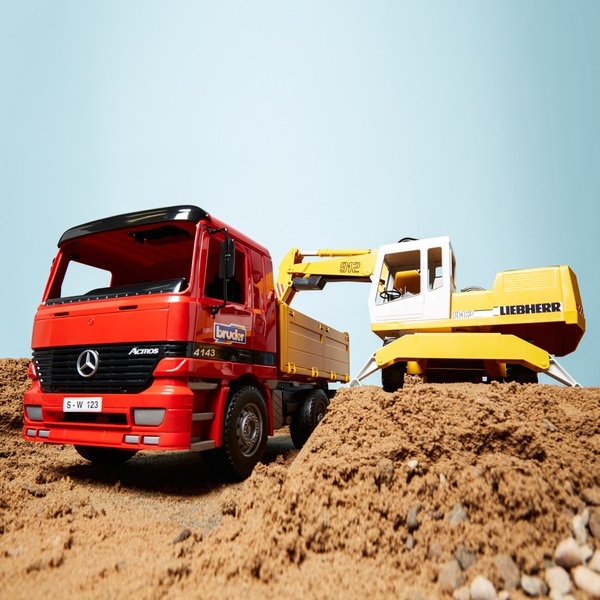 All this happens in the blinking of an eye with this set, consisting of a Liebherr Excavator and MB Actros construction truck. The sides of the construction truck can be folded down on three sides to unload the transported goods in all three directions. The trough can also be tipped and latched. The excavator arm of the Liebherr Excavator is fully functional and the cab body and arm can be rotated through 360° on the chassis. Two support legs ensure stability.